Model T Ford Forum: OT Younger Generation will they want these cars? Model T Ford Forum: Forum 2014: OT Younger Generation will they want these cars? You will want the short answer? It's no. Just too antiquated, different, slow, unsafe. While there will always be a small faction of the public that has an interest if you delete everybody you've named I'm betting the number is miniscule. While the Model A for instance, will never die it's more of a car than our wagon with a motor will ever be. I was just at the HCCA convention and tour in Sierra Vista, AZ. Last Friday several cars, including a T, visited a pre-K-to-12 charter school. The kids were brought out to see - and climb into - the cars. They loved it. One young man had gotten his learner's permit the day before. He got a hands-on-the-wheel driving lesson in the T. Happiest 15-year-old in Arizona. Don't write off the younger generation. You can see my posts and pictures of the tour at hcca.org. Click on Discussion Forum on the upper right of the home page, then click on tours and swap meets. No pictures of the kids, because they have to be cleared by the school. But several other pictures, including some Ts. I don't think young kids are any different than old kids (us). I think they will want them and enjoy them every bit as much as us. We also bring out the cars to the schools and let them experience the Laurel & Hardy Cars.. They are excited about the adventure but....its only a memory! There will always be a percentage of kids who want the fastest thing available, and those who would rather go low and slow. I have always loved anything mechanical. Not all kids are like that, but there will always be a few. What we have to do is fan the flame when we see a youngster with a spark of interest. Take the time to let them see the car and answer the questions you have answered since the day you got the car. Take the time, plant a seed, make a future T nut. I always wanted a 50-54 Chev, until I got a ride in a 1915 model T touring car. I got to see a T up close and smell and hear it. I was hooked. Biggest groups I get around mine at shows (and with the exception of my '30 Town Sedan, my fleet is all doodlebugs and conversion tractors) are comprised of people under 25. Want to build interest in a younger generation? Then seek venues to engage them. Too many clubs are interested in closed tours that end at some restaurant that offers an early-bird special. Young folks ain't there guys. Fairs, parades, schools are where they're at. And you need to engage - not hang out in a cluster with the other owners and BS amongst yourselves. Talk to them! Otherwise, be prepared to be boxed up in your ride when your time comes - because the interest won't be there. I young and capable of taking care of LOTS of Ts, somebody just needs to give me theirs so I can prove it. To some extent it's up to us. I became interested in T's due to my grandfather and his TT. My 14 year old grandson is interested in T's because of me and the same TT. He's been "helping" me work on it since he was 2 years old. Of course, now he really helps, when he was 2 years old it was more a frame of mind. Getting the cars out where youngsters can see and hear them is the first step. They do seem to capture a lot of attention. In time as there are a lot available there will be groups of younger folks acquiring them but not necessarily as we expect them to. They will decide how they want to enjoy them. Maybe if we are careful we can leave them some of our ideas and values. All kids love anything mechanical, particularly high school kids who are about to get their license or just got it. But put a Model T next to an SS Chevelle and see right where their interest goes. On TV I can think of three shows that deals with hot rods or muscle cars. Can't think of a one that deals with Model T's or other antique cars. Yes, there will always be a dedicated following for antique cars, but will there be enough to support the hobby at it's current level? Can't answer that, my crystal ball is broken. Henry, its great that your kids are involved with you but thats not we we are discussing here. 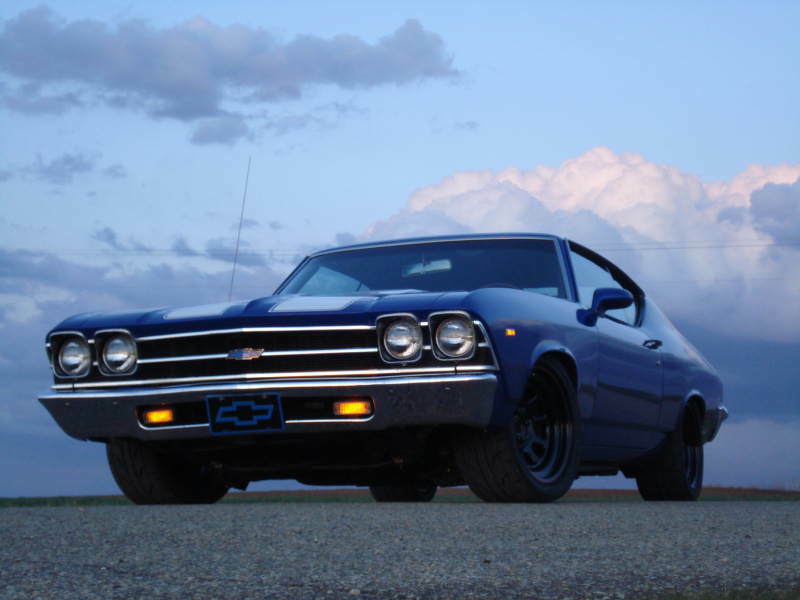 It generally about the younger generation that is not related to the owners to see if there is interest in getting really involved in the antique car hobby. I was in my late teens when I became interested. My 26 sat on a hill top for 20 years in full view I drove the John Deere past it enroute to the field with no interest All of a sudden like girls it started looking pretty good and I hooked a chain on it and dragged about 2 miles in to the yard where I put it up on blocks and oiled every nut and bolt. It became instantly precious. I cleaned it up redid the engine paint and fired it up that was the most exciting day of my life. The hunt for parts and the people you meet in the process is priceless. To acquire a finished "T" may have limited love. There is no substitute for dragging a car out of the bush, off the prairie, out of a barn (fresh) or even the bottom of a lake and get it running again. 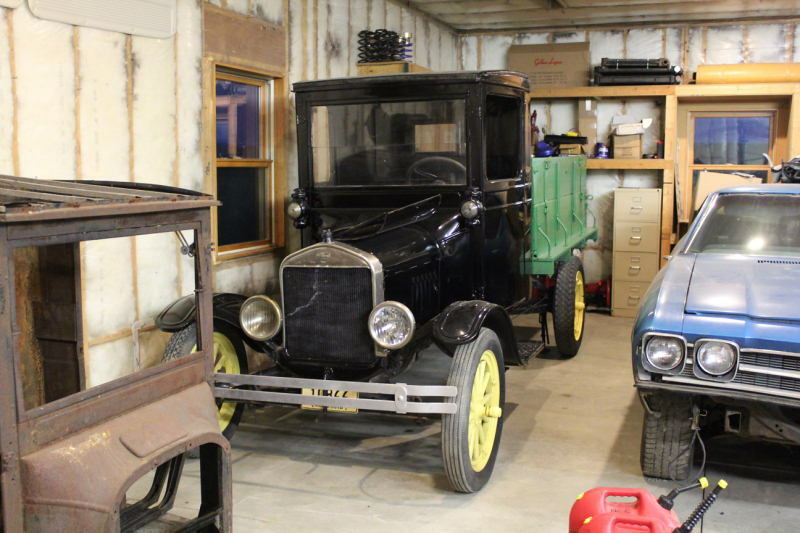 How many of you have identified a "care taker" for your Model T after you are gone? How many are just going to let your family have an estate sale and sell to the highest bidder? I believe the future of the Model T is up to each and every one of us. As Erich stated above "what we have to do is fan the flame when we see a youngster with a spark of interest". Spend some time in the shop with a younger person teaching them, they are out there it just takes persistence in finding them and then being willing to work with them, making the newcomer feel welcome and a part of the group. Get them into your clubs and make them a part of the club by getting them on committees and let their voices be heard. In the last 6 or 7 years I have personally been involved with "fanning the flame". We built a speedster in one of our local high school auto shops attracting a couple of new members to our club. The auto shop instructor and one of his students. 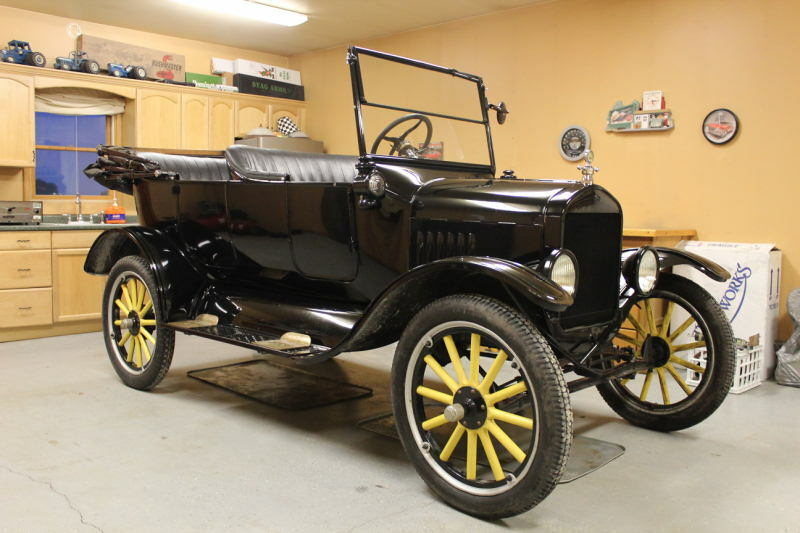 The instructor purchased his own Model T and the student is building his own speedster. (The student was on our clubs scholarship committee this year). There were, as people have said, several students that did not want anything to do with the Model T. Those students would rather be working on their own car or pick-up truck. But though the 4 year project there was always 4-6 students that really wanted to work on the speedster. I have also been spending at least one Saturday per month for the past several months working with a 23 year old college student and his 25 touring car. He has rebuilt his front end, rear end, re-wired the entire car, rebuilt his generator, rebuilt his coils, adjusted the timing, and numerous other things in my shop. He is excited about his car and can't wait to tour with us this summer. His plan is to rebuild the engine and transmission next winter. I do believe that there are younger people that will be interested. I do think that they need to be mentored just as most of us had a mentor. Richard is correct when he said "Getting the cars out where youngsters can see and hear them is the first step." Remember that a younger person is not just in his teens or 20's, there are plenty of younger people in their 30's and 40's that need the "spark fanned". Robert talks about taking the "Laurel & Hardy Cars" to schools and only creating a memory, I think that some of the memories might last for a lifetime and some of those kids buy a T when they are older. I don't think you will always see instant results. As a said before it is up to us, the current "care takers" to find the "care takers" of the future. MIKE....HERE HERE!! !.........good job!! 2 thumbs up!!! There's a Part II to this that's worth mentioning. They're Model Ts and Model As - mass-produced for "the masses." We'd do well to remember that. What I'm talking about is pricing young people out of the hobby. So, you have a Dave, or Seth or Spencer and they are interested - but when they look to act on that interest by trying to buy something, they find that the cars built for the "masses" suddenly have Packard or Pierce Arrow price tags. Unless you get boxed up in them, you cannot take them with you guys. We are simply temporary caretakers - pushing them along to the next generation - we are not "owners." Price them so the next generation can be caretakers themselves. If you are trying to "get back" what you "have in," you are in the wrong hobby or have been watching too much Barrett-Jackson. The same is true for parts. I am second-generation in this hobby and have been around it/in it for 40 years. Used to be parts were reasonable for an A or T at a flea market. I am shocked at what I see some people asking for very common things on a table or blanket at Bennington or Amherst, NH. I NEVER saw my father "sell" a part that he had and someone else needed - he simply gave it to them. I've continued that protocol and raised my son to do the same. Spark the flame of interest through active engagement in places where young people are present. Seek those venues out. And once the interest is sparked, fan the flames by being generous with help and reasonable with prices. REMEMBER, Mr. Ford said: "I will build a car for the great multitude. It will be large enough for the family, but small enough for the individual to run and care for. It will be constructed of the best materials, by the best men to be hired, after the simplest designs that modern engineering can devise. But it will be low in price that no man making a good salary will be unable to own one-and enjoy with his family the blessing of hours of pleasure in God's great open spaces." And Dave Mazza is correct above - BE NICE!! I've seen EXACTLY what he is talking about and can understand where it is a huge turn-off. The only thing worse is the crotchety old "expert" who, totally unsolicited, picks a young person's treasure apart at a show or tour - pointing out every flaw and shortcoming - everything "not original." Thank you Ron, Im in this hobby because I love old cars, I will never know everything about them. I will also lend help and time to anyone who needs it! If someone cant crawl under their car or crank it by hand or push start it, send me a pm. I would be happy to help, my car is going to take a while, maybe I get someone rolling sooner than me! This is supposed to be a fun hobby to bring people together! I think that a Model T is unique enough to generate interest for at least 2 more generations. There is still enough of them around and being restored to generate interest because of what they accomplished for the average individual. Not having any offspring, I can only hope that my cars go to loving homes when I cannot enjoy them. The only sure way to insure that is to will them to a museum. True, the interest in restoring T's has lead to the availability of enough parts to practically build one from scratch, but the hot rod and rat rodding craze hasn't dried up and in fact has gotten stronger and too many cars in the future will be turned into the "50's hot rods" of the future. There is too much demand for hot rods and not enough steel bodies to build them from without parting an original car. 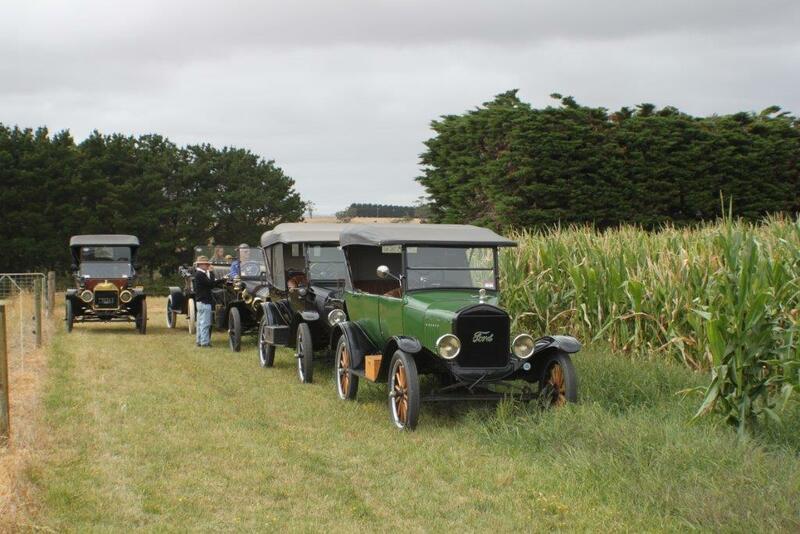 Its the same scenario that has played out ever since the first flathead V8 was installed in a T.
While it's true there will be some younger people wanting Model T's in the future, the fact is it will be a vastly smaller amount - most likely not enough to justify the reproduction parts manufacturing sector, that has made keeping a Model T so easy. I work in a place with the younger generation doing trade type courses and I can tell you most kids now have no mechanical aptitude or any personal interest in actually working on anything. Kids do not build stuff anymore. The ones that visit this forum, or belong to family members that do might, but they would, wouldn't they? What about the 99% that don't? Hasn't anyone noticed the decline in people being able to do basic household DIY stuff? The skills are being lost. Unless it's available through an iPhone app they don't want to know. Of course, people will always come up to the T's at shows and admire them. But having the desire to actually have one themselves and have to work on it is a completely different thing. One must not be blinkered by being around other 'old car' people all the time and thinking there's a huge interest when in the outside world there isn't. John H - The one percent that is left is still more people than there are cars. Food for thought. 1% of just the U.S. population is more than 3 million people. It is true...on my street there are 6 houses. The missus and I are the only empty nesters who are now over 20 year in the place, the rest maybe 5 year or less, complete with rug-rats. I say to the missus, when I retire soon we're going to be making a lot of money as chump change and maybe even cash! I'm handing out a flyer to these neighbors and the ones around the corner...every day, there are trucks at least at one or another of the other houses and the lettering on the door of the trucks always starts with 'A' no matter what trade it is. Well, you ding-dongs who hang a "DO NOT TOUCH" sign on your cars at shows are alienating not only youngsters, but some of us old fttts as well! I invite the kids to sit in my T so that their folks can shot them (with a camera) at every show I attend. Get them involved - hands-on - let them TOUCH your dang iron, then perhaps you'll instill a little interest in them. And, you know what? The kids LOVE it! You have it John. In a nut shell. When it comes to actually doing it it's another story. Most would have a purchased complete more modern with the options that are common today. That's a car to youngsters. It isn't a part of "our thing". My first T purchase was just a bank account on wheels to the heir's of the former owner. In my kids l see that they do. 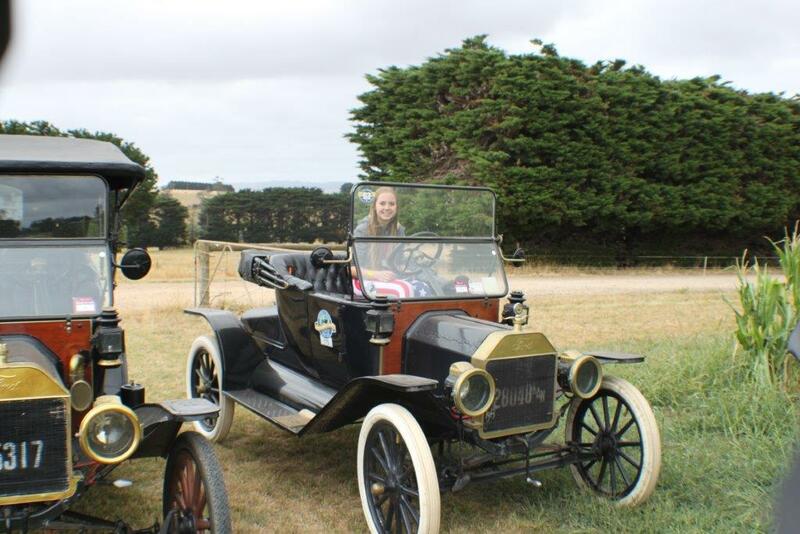 my 15 y/o daughter pictured below last week driving has a love for her 1913 runabout, my 10 y/o son loves his 13 touring and drives it around the garden when l allow him to and my 14 y/o daughter is a bit 50/50 but still likes her 26 tudor ... and smiles ( laughs ) at the other two when it rains hard or is just plain "YUCK" out in the cold hard wind. Only time will tell in our instance as to whether the love affair will last much longer than the time they get their BMW's and their licenses. 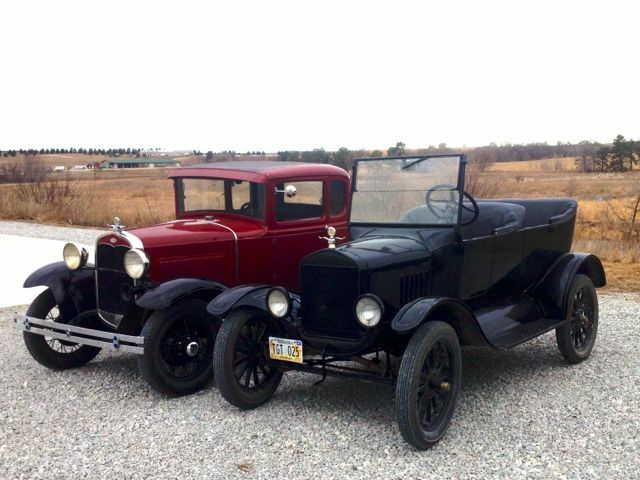 But while they are happy to drive and "appear" interested, l'm more than happy for them to share in the fun that is driving a model T..
Dave Mazza - sent you a PM on a speedster connection in our neck of the woods. David Down Under...you're one of the lucky few who happens to have "enough cars to go around" for the kids to just step into and enjoy. What's going to be hard for the up and coming kids is the ability to AFFORD these machines in the first place, let alone the non stop upkeep. Without getting too political here, with the upcoming economic disaster that a certain national program is thrusting upon the quickly diminishing middle class here in America, there will be no possibility for the vast majority of future generations to get involved with this hobby. Cripes, I myself will end up thinning the herd just to maintain ourselves. These kids will barely be able to make a house payment along with student loans. That said...I have at least had the great opportunity last year to really promote this hobby to about a half dozen very interested, eager teens, both male and female. Again, I just hope they can afford it. I'm with Seth. I just turned 30, but I have a pretty big barn in which to put any "excess" Ts I find along the way. I'm 35, I have a few friends that are quite a bit younger than me (mid-20's). They love my Model TT truck....think its pretty cool. I even taught one of them how to drive it. He had fun...said "It's really cool....kind of like a go-cart" which, to his generation, is as close a comparison as he could make. One thing I can tell you that will restrict the hobby for a younger generation is the price we are asking for these cars. We put a lot of time into these cars, and time is money...but the more we try to get for them, the less likely someone from a younger generation will buy one, and even less likely they would risk actually driving it. I wish I would have had a benefactor to help me get into T's....I'd love to have another one and take care of it (I do think of them like living things), but not for $14,000. No way. That is too big a liability. My truck cost me $6,500. That is cheap for a T, but in comparison it is 3x what I had to pay for my totally awesome 1953 Ford Customline sedan (which can go over 20 miles per hour, holds more than 2 people, has twice the cylinders, and has a heater). A guy at my church found out I was looking for a T last fall. He had one...he got it year and years ago, he knew me, knew I didn't make much money, and he offered to sell me his tired T for $10,000. Whether we have "put that much into it" or not, or whether it is really worth $20,000 or not, in the end, most kids don't have 10-20 grand to plop down on a go-cart. These are luxury purchases. But that being said...there are 7 billion of us. I'm sure these cars will be taken care of in one way or another. Donnie, What about all the specialize repairs that people preform for the hobby, Who's going to take them over? Babbiting, coil repairs, machine work which in my area is almost non existent...etc. Mac's Auto Parts just sold their business a year ago to Chinese investors. More and more catalog companies are closing up shop. That can be a issue for future restorers. Younger Generation will they want these cars? No! Because the only skills they will have besides what they pay to learn in college will be how to break bubbles with their finger on their Ipad! With all my nieces and nephews and their children, I don't know of a single one who is interested in woodworking, electricity, mechanics, etc... The good Lego sets with all the gears and motors are virtually unavailable. HeathKit is an unknown name to anyone under 40. Kids carpentry sets used to have hand tools that could cut and shape wood, now all the tools are plastic and you "pretend". But then, on the other hand, tons of people still keep horses for a hobby and they are WAY MORE EXPENSIVE and maintenance intensive than a garage full of Model T's, even if you pay someone else to keep them running for you! kids today don't have any money $$$$$$$ Todays T prices is as high as buying a Packard or a Pierce Arrow. They are not going to spend $20k $30K or more on a restored T that just sits there a drive it 2x a week when the weather permits. Bob Steiner,Have another cup of coffiee!! Your right,i don't think [kids] are going to spend that kind of money either!I think most will start with 4 to 5,000 drivers or hand me downs! Some will even start with parts or a chassis.Bud in Wheeler. I think you guys are getting a bit off the wall comparing T's to Pierce Arrows and such. A T will never command that kind of money. I think they'll always be a starting point for someone interested in a classic ie: the lowest priced car in that field. But that isn't the problem. It's the driveability/safety/lack of options. Like Ryan said: a go-cart. it's not a bad description. I prefer: A wagon with a motor in it. They aren't cars by today's standards. I've been asked twice if my '23 Touring was a kit. People get in for a ride and the first thing they do is look for the seat belts. It's ingrained. They can't help it. Interest generated at shows, schools, ect. is great but it doesn't predict the future of the hobby. I hope it never happens but I truly believe they'll be banned from the roads in the future. Sometimes you just get too old. there is a trend that is quickly becoming the norm I've noticed and that is the hot rodders. I tought one of my oldest and dearest friends how to drive the T. He was scared that it was too fragile. When I showed him it wasn't that fragile he relaxed and enjoyed the ride. After it was over he said " that was fun, but it needs a V8." I have a 1913 RHD project I am starting to tear into and its the same thing from all my friends. It would be easier to put an automatic in it. You should put a distributor in it. Big fat tires would look better. You cannot fix people like this, and you cannot show them the fun of it when they simply want a turn key car. I find the argument of "Today's children don't have any money" a very weak one. Today children have more things handed to them then any generation in the past. All they do is whine and mom or dad hand it to them. If you don't believe me go stand in the mall for a while and listen. Listen not only to the parents and children but between the children as they talk among themselves. They brag about how they obtain what they want. Look at all the expensive clothes and shoes as well as the latest phones and computers that they have. They didn't buy them they were handed them! Children today do not know how to work and when you do hire them they want a 9 to 5 job, full benefits, days off whenever they want, and want the same salary that you have after working for 40+ years. I guess they will take a Model T if it is handed to them and if you repair it for them so they can enjoy life because they are soooo stressed out. Today everything is "dumb down" so they can achieve their goals instead of making them obtain the goals that were set in the past. If I wanted anything I had to earn the money to buy it and was taught to save until I could afford it. Making a hot rod out of them is the worst thing you can do. It definately will not make them safer, and to do all the modifications needed to make them safer as a hotrod, will make them look so strange they will no longer resemble a Model T. It is something like the 50's and 60's cars which have had the suspension modified. I have a hard time looking at them, because they don't look anything like the cars I remember when I was growing up and in high school. "Today's children don't have any money"
I do Carlisle and the Hershey Car shows as a vendor. I see whats in peoples wallets and believe me not much there. The younger people all they do is walk around. We came to Carlisle just to walk the isles not to buy!! their interest is the 80's = cars rice burners, crotch rockets, and flashy babes. from a electric train convention and I was one of the youngest there (64). If you see a young person there they where "forced"
Kids are never likely to make up the majority of the Model T hobby. It will always be an older crowd, but as long as people are still getting older I think people will continue to enter the hobby at an average-age near retirement. I'm not going to worry about it. I'll enjoy them and try to share them as much as I can and hope that some young person gets "inspired", (or at the very least, amused), by seeing the cars on the road, in use, and stirring up some fun. They can't want one if they don't know they exist and can be driven and enjoyed. It's really the best we can do. In 2003, during Ford's 100th anniversary, I was one of the drivers who gave Model T rides to the public at Ford's world headquarters. Any worries I had about future generations wanting these cars was eased some by the fact that, over 4 days, we gave over 25,000 people a free ride in a Model T. Most stood in line for at least 2 hours in the hot sun for the opportunity. I keep saying it over and over,We run our cars at the public's pleasure!! There are roads we can use and some we shoulden't! Any old car holding back traffic and belching smoke from marvel oil does none of us any favor.Classic?? Bud in Wheeler. Charlie B, re-read the posts about Packards and Pierce Arrows (I think mine was the first one). No one is saying a T should command that price - everyone is saying the opposite. But there are tons of people selling Ts (on Ebay, on Craigslist, in Hemmings) and pricing them like they were Packards or Pierces. Young folks can't afford that. Same issue with parts in a lot of cases. And by "young" I'm not limiting that to the kids in a mall. This is a family based hobby. With today's cost of living, not many young families can afford the prices being asked by a lot of the caretakers out there. Cost of living is not going to go down, so if there is a genuine, community-wide concern regarding the longevity of the Model T hobby, the caretakers need to come off their Barrett-Jackson price aspirations and start posting some reasonable asking prices for what was conceived as the car for the "every man." I don't know. I can think of several T guys that have grown children who have absolutely no interest in Dad's Model T's. I also can think of several T,s that were willed to children and I never saw them again. I suspect they were quickly turned into cash or are sitting unloved, rotting and ignored in crappy storage or worse covered with a plastic tarp in the back yard. As a member of the younger generation (22) perhaps I can add insight. Money is a major factor. Not saying that the sale prices are too high, but it is all compairative. There is not much $$$ left after bills, rent etc nevermind the thought of saving for later on down the road. I do not currently own a T, but have been seeking one for the past seven years. A small faction will always hold the Model T dear, but that number may dwindle as the years go on. Modern cars are putting even more distance between the two worlds of vintage and new vehicles. This makes it difficult to navigate a T in traffic and makes for undue stress. Unfortunate that we can't get back to standard cars with limited electrical componants (something you could fix in the drive way) but over all drivers are lazy today and want the car to do everything for them. My first experience driving a T at 16 has had me hooked ever since and I will keep my goal of one day owning a part of history. There will always be care takers, but my fear is that future generations of care takers will be rich collectors, with fifty cars enjoyed by that one person only. To really survive each of us needs to get a kid or two interested and pass a vehicle on for free or very cheap. This of course will generally mean generation to generation, but doesn't have to. A neighbor has been quite generous to me with parts and experience it hasn't cost him much but has helped me a great deal. My kids have rode in our doodlebug through the woods since they were two weeks old, they get greasy and take pictures of it to show and tell at school. I am pretty confident the girls will gladly accept the responsibility of care taker when they are older. My father made the comment that me dulling/breaking tools in his work shop when I was a kid was cheap education. He was right, his love was passed on in me and my brother, the cost of the dropped calipers, broken blades, etc... are now long forgotten and it was much less expensive than a college course to learn the same thing (minus the passion?). The doodlebug was only 300$ and a lucky find, but my family could never enjoy the hobby (or is it lifestyle?) in an on-road, restored vehicle if our car had not been passed down from my father in law to my wife (who's passion came from tours with the family). To keep this hobby in the hands of the everyday person it needs to be passed down not bought. I don't think trying to rely on 50 something year old's picking up the hobby once they have disposable income will work very well. Their kids will wonder what to do with dad's hobby being that they were too old to pick it up. My three girls won't know life without the hobby. Also I think the maker movement is working in our favor. There is a huge social shift, especially with the younger demo, toward hands on projects. Kids are finding enjoyment in troubleshooting and tackling building projects whether it be robots, rc cars/helicopters, or legos. Collector cars are owned by people who can afford the garage space, tools and time. Of course Model T's will always be wanted by someone. In the near future it will be even easier to make reproduction parts with digital imagery scanning straight to CNC programs and casting mold programs and waterjet programs. Anyone who wants to buy my cars be sure to go to my estate sale. I predict frenzied bidding. Royce please ensure that after your demise you post the details of your estate auction!! Royce, that technology has been around for over a decade +.. also laser rapid prototype fabrication, 5 axis routers, rubber moulding (castings) all downloaded from CAD systems like Solidworks, Unigraphics, Pro E Mastercam etc..
Royce, May I have a list of what you told your wife you paid for them? I don't know. I can think of several T guys that have grown children who have absolutely no interest in Dad's Model T's. I also can think of several T,s that were willed to children and I never saw them again. I suspect they were quickly turned into cash or are sitting unloved, rotting and ignored in crappy storage or worse covered with a plastic tarp in the back yard." Sadly Paul is correct! I had little interest in my Dad's T and A until later in life. Fortunately my Mom refused to sell them and kept them in the barn under cover, until I came to my senses about 45 years later. I keep hearing about Ts and As that people inherited that are just sitting because they either don't care or are afraid of them. Some have no idea about their worth but don't want to be taken advantage of so they would rather not think about selling them. Robert, thanks for starting this thread. This is a discussion topic of almost every car club and, obviously, of interest to the MTFCA. On behalf of the directors, I want to thank everyone that is exposing this great car to the younger generations. There are some great comments on this thread which we can all use to help our cars go to new caretakers. Dena and I are lucky to have family and non-family future caretakers for our Ts. Thanks again to everyone who is helping to support and keep this hobby going for generations to come. Thanks everybody for your voice on this critical matter. Not only give people rides and the exposure of the car experience but mainly talking to them young or old. Invite them to your local club function? Get your T out and let people see it working. Let them sit in it. Take them for a ride. Obviously, not everybody is a candidate for that last one, but in the appropriate place with a qualified person it's probably the best hook. Fred Dimock and Paul Mikeska - You guys have hit on the exact reason that it is important for us to get our cars out and in view of the public. There are cars that have been handed down to the next generation and are just being stored. I believe that a lot of it is because the new owners know very little about what they have so they choose not do anything with it. I can't tell you the number of times that I have met someone that has inherited a Model T and needs help getting started with it. That is how the 23 year old college student I mentioned in my above post got his car. We need to have our cars out so that they attract those people, then offer assistance in getting them involved with their cars. Help them to learn to drive and repair the car. To me that is the main reason we have a club. If you are visible, you will attract these people. People come and go but the cars are still here, somewhere. Last year I had a woman bring me a car that she had inherited. She knew nothing about it but did want to learn. The car was not in running condition, she admits that she does not want have to repair it herself, but was willing to pay to make the car into a reliable runner. I did the work on her car and then taught her how to drive it. When she finally got the hang of driving it she was one big smile ear to ear . She now drives it frequently and knows who to turn to if she is having problems. It is important to pass on your knowledge to these people or point them in the direction where they can obtain the knowledge. In time they will develop the passion that we have. Here is a photo of the woman's car. Jeff, you forgot to have them pay for the gas!! At the shows I go to they do not allow the spectators to sit in the cars. I can kinda understand there point, BUT.... When I stop at gas stations I let folks get in a sit all the time. Now and then there are rides also and sometimes if I can find a open space and she's pretty enough they get to drive it. I'm 31, and prefer to keep a couple of each around. If you are talking to someone of average income that is really interested, it wouldn't hurt to show them your Lang's or Macs catalog so they can see how abundant and affordable most of the parts are. I'm sure many are automatically scared off at the thought that a car that old must be a rich mans hobby. Derek, I actually saw that happen last year. I visited a classic car place down by the Twin Cities because they advertised a Model T touring for sale. They had maybe 50 cars in the building for sale. They ranged from muscle cars, to Jeeps, to 56-7 Chevy's, a couple of other 50's vintage cars, and right when you walked in...the most beautifully restored Model A roadster you'd ever seen. During the three hours or so I was there closely checking over the T, probably 35 people came and went ranging from mid-50's to pre-teens. During my stay there, I was the only person who even stopped to look at the T. Most walked in right by the beautiful Model A and ignored that too. Same went for the cars from the 50's. Invariably the 60's-70's muscle cars attracted all the interest. Dad's and kids crawled all over them, looked at the engines, and sat behind the wheel. None even gave the older cars a second look. That spoke volumes, and I don't think it is atypical. DAVE WELLS has the point here that more than clearly shows just how affordable our "could be if you wanted to be" hobby really is. Do we need a prize winner to own in a T .... No. A rusty old bomb that is brought up to a safe vehicle, will probably get just as many folks pouring over it with their camera's just to say, have a look at that, it still goes. People do not like me to park by them at car shows.If people show interest i will put them and kids in the car,explain it,take pictures,and often take them for a drive.I always try to show the free starts,mag starts and usually take a drive through town.engine and tractor shows are much better with a better class of people.Bud in Wheeler. Interestingly i find quite the opposite to be true, at least here in south jersey. We ALWAYS have a crowd around our cars and a line of people waiting to get in them. I have been parked next to a 73 Mach1 convertable with a full cage and blower motor and after the show he said "man your cars really get alot of attention." I was parked between a 2008 mustang 500kr convertable and a 1988 ferrari testarossa at another show and had the same huge crowd. We go to the shows with the intent of bringing the cars and history and a way of life to as many people as we can. We enjoy talking to as many folks as we can and letting them enjoy our vehicles the way we do. There is a very simple answer to this question. That answer is, yes, they will want these cars. For those of you who said no, I have to disagree with you. With that being said however, that interest needs to be nursed along, so people new to Model T's can see how much fun these cars can be. I grew up with my grandpa owning a Model T and Model A. However, last March he passed away and we were faced with the decision of what to do with his cars. Luckily, we were able to find a guy to help us with the Model A, as well as Mike Vaughn to help us with the Model T. Originally, it was looking like my family was going to sell the Model T, however after meeting Mike, and seeing and driving his cars, and knowing he was willing to take the time to help us with the Model T, we decided to keep it and have been working on making it a safe, good driving car ever since. In short, yes they will want these cars, but it takes guys like Mike and others who are willing to take the time, and help new people to the hobby along. 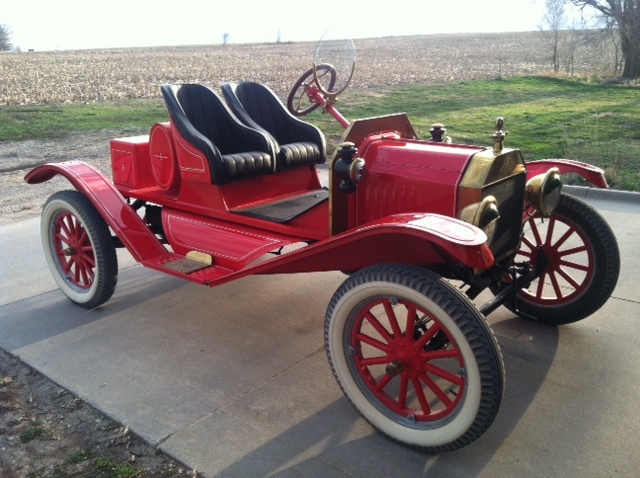 Many of you have stated that the younger generation has no interest in Model T's and other antique cars, or anything mechanical for that matter. Luckily not everyone thinks like that, or else, yes there would be no interest from the younger generations. Instead of just assuming there is no interest, I would recommend you should get out, drive your cars, find younger people who are interested, and get them involved in the hobby. If you did that, you would see there is in fact members of the younger generation who have an interest. For example, I took my T out for a drive today, and while stopped at the gas station a grade school aged kid and his dad came over and asked about the T. After talking to them for awhile, explaining the different parts of the T, and the history of my car, and letting the kid turn the grease cups on the rear end, the kid couldn't have been any happier. It seems this topic is brought up frequently, and there are always several younger people, like myself, who chime in and prove there is an interest from the younger generation.